By nature, all dogs are facultative carnivores, thriving on a varied diet of meats with smaller amounts of fruits, vegetables and grasses and biologically adapted to metabolize proteins and fats - not carbohydrates - as an energy source. High-protein and low-carbohydrate, ORIJEN ADULT's grain-free formula replicates the same rich balance of meats, fruits, vegetables and grasses that dogs would encounter in a wilderness setting. 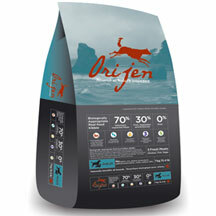 Made with the highest inclusions of fresh grain-fed chicken meat, wild-caught northern whitefish and fresh whole eggs, ORIJEN is bursting with the protein-packed, veterinary-inspected meats (minimum 70%) that form a Biologically Appropriate diet,—and none of the grains or carbohydrates that are inappropriate for your dog.